CSI Enterprises, Inc. announces the creation of its corporate foundation, Power2Change. 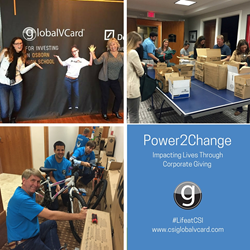 While corporate giving has been core to the company’s operations since its founding in 1989, the formation of Power2Change provides the opportunity to give more strategically and better organize, focus and track the impact of CSI’s philanthropic efforts. After 27 years in business, CSI remains steadfast in its commitment to donate a percentage of revenues every year to charitable causes. Power2Change formalizes this commitment, with the ‘2’ representing the basis points (BPS) that will be donated every year from the revenue earned on payment transactions that the company processes. Considering that billions of dollars are processed through CSI’s award-winning globalVCard paysystems platform every year, the potential impact can be life changing for recipients. Another benefactor of CSI’s philanthropy in Michigan is Elk Rapids High School. The construction of a concession stand is underway, which will be operated much like a start-up business. Students selected to participate in this work-study initiative will have the opportunity to gain real world experiences to prepare for careers in business, marketing, entrepreneurship, nonprofits or athletics management. CSI’s culture of giving extends through every employee and into the communities in which the company operates. From packing hygiene kits for the homeless, feeding the hungry or building bikes for foster children, lunch hours are often filled with groups of employees rolling up their sleeves to make a difference. Learn more about CSI and its company culture at https://www.csiglobalvcard.com/our-company/.